20. 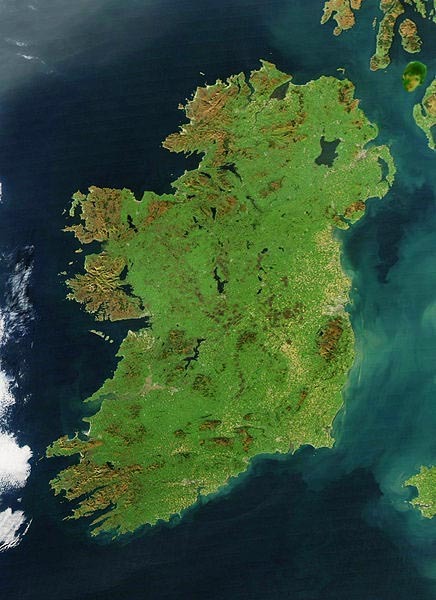 Ireland is an island located in the North Atlantic Ocean. It is the second largest island of the British archipelago, the third largest European one as well as the twentieth largest worldwide. 19. Famous Irish novelists include James Joyce, Bram Stoker, or Oscar Wilde. 18. Famous Irish musicians include Bob Geldof of The Boomtown Rats (who is also known for playing the character ‘Pink’ in the 1982 Pink Floyd film ‘The Wall’), Paul David Hewson and David Howell Evans (better known under their stage names Bono and The Edge) of U2, or Phil Lynott and Gary Moore of Thin Lizzy. Ireland is also worldwide renowned for its cheerful sounding traditional folk music. 17. Most common Irish family names start with either ‘Mac’ or ‘O’…’ which translate as ‘son of’ and ‘grandson of’ respectively. 16. Bram Stoker’s ‘Dracula’ might be actually based on a certain legendary Irish vampire king by the name Abhartach and not on the Wallachian prince Vlad Țepeș. 15. The main symbols of Ireland are the Celtic Christian cross, the golden harp, and the green Shamrock. 14. The River Shannon is the largest river in Ireland. 13. In order for an author to top the Irish bestseller list his or her book needs to be sold only in 3,000 copies nationwide. 12. Cats outnumber dogs two to one as the most popular pet choice in Ireland. 11. Ireland is home to numerous imposing medieval landmarks such as the Rock of Cashel or Trim Casle. 10. Modern Halloween is actually originated in an Ancient festival called ‘Samhain’ that was celebrated in Celtic Ireland. Subsequently, this Celtic ritual got Christianised and gradually evolved into the trick-or-treat contemporary holiday. 9. The 4th largest European stadium is located in Ireland. The Croke Park Stadium based in Dublin is a 83,000 seater which can be used for various cultural and sporting events. The stadium is surpassed in terms of capacity only by Olympisky in Kyiv, Ukraine, Wembey in London, U.K., and Camp Nou in Barcelona, Spain. 8. A song by any solo artist or band only needs to sell about 5,000 copies in Ireland in order to top the Irish music charts. 7. The poetic term ‘Emerald Isle’ (used mostly to denote Ireland’s mesmerising green-tinted countryside) was firstly referred to in literary form by William Drennan in one of his poems entitled ‘When Erin First Rose’. 6. Roughly one billion liters of Guinness are sold yearly, making it one of the most famous and recognizable Irish brands globally. 5. There are a lot of original funny Irish expressions you should know. Among them, the most interesting ones are: ‘You’re sound’ (You’re cool), ‘I’m off my head’ (I’m intoxicated), or ‘Well!’ (Hello). 4. Dublin was initially founded by the Norsemen during the turbulent Viking Age. Apart from Dublin, other major Irish cities (such as Cork or Waterford) were initially founded as defensive Norse settlements (or ‘longphorts’) during the Early Middle Ages. 3. As of 2012, there are only 140,000 native speakers of Irish (Gaeilge) in Ireland. On the other hand, Hiberno-English is the main set of English dialects spoken throughout Ireland. 2. Although Saint Patrick is the patron saint of Ireland, he was actually born in Britain and his parents were Roman citizens who lived in either Scotland or Wales during the late 4th century AD (according to different accounts related to the life and deeds of Saint Patrick). 1. Ireland has the second highest amount of redheads in Europe, namely 10% of its total population (just behind Scotland). In other words, circa ten percent of the Irish people can carry the recessive gene that is responsible for red hair.